Monday afternoon, a delegation of students voiced their concerns to the RJ Julia general manager outside of North College after a meeting between two students and the general manager was interrupted by a fire alarm. Posted by wilk on April 25, 2017 at 4:07 PM. Posted by Rachel on October 10, 2015 at 8:47 PM. So maybe you’re a freshman, nervous and overwhelmed by all the information coming at you about classes, housing, what to bring from home – and are feeling like you can’t even begin to think about bigger issues on campus. Or maybe you’re a senior and feel like you’ve gotten this far and never really involved yourself in any social/political engagement on campus, so now it’s way too late and where would you even begin if you wanted to. Wherever you might stand, activism at Wes can seem like a huge, widespread and unnavigable thing. 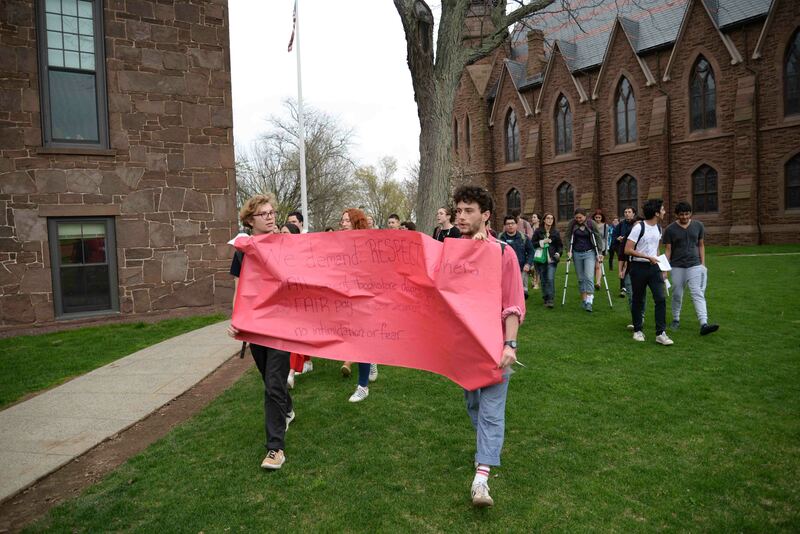 Thankfully, some very committed students are trying to change that sentiment and make activism within the Wesleyan world an approachable and cohesive community. This past week, the Disorientation Guide was released through the University Organizing Center site to bring together the wide-ranging issues affecting us into one document. The entire Disorientation zine can be downloaded here, and I strongly recommend that everyone take a look at it. Posted by ztevenz on August 25, 2014 at 10:55 AM. Elizabeth Warren continues to be a powerful force in the campaign to fix the student loan system. Warren spoke at a recent hearing for the Health, Education, Labor & Pensions committee, saying that although the interest rate necessary to cover the cost of the student loan program without making a profit would be about 2.5%, the government is charging students nearly twice that amount for undergraduate loans, and even more for graduate and direct loans. But Warren has come under fire from critics who say that the figures she is using in her argument are wrong. Posted by ztevenz on April 4, 2014 at 2:49 PM.